The way Logan Webb sees it, he can't lose. In the midst of his first big league camp, all indications are that the No. 5 Giants prospect will return to the Double-A Eastern League to open the season, but the organization does not expect him to remain there for very long. "As of right now, he'll go back to Richmond," Giants director of player development Kyle Haines said. "But he has the stuff to make a jump quickly. He's really not that far away. We'll keep a close eye on the situation and always do what we feel will be best for him." Flying Squirrels manager Willie Harris is happy to fill whatever innings he can with the 22-year-old right-hander. "I'm looking forward to him pitching with us again to start the year, but I don't think he'll be here for long," Harris said. "There really isn't much for him left here besides to get more innings. That young man has a very bright future ahead of him." When the time comes for Webb to move up, the next stop will most likely be Triple-A Sacramento, with Raley Field 24 miles from his hometown of Rocklin, California. "It would be totally awesome to be back home and pitch in Sacramento," Webb said. "I had season tickets for the River Cats with my dad when I was a kid and they were the A's affiliate, and I remember we went to all the games. So, yeah, it would be special to get back there, that close to home, and have family and friends at every game." Webb grew up rooting for Oakland -- parent-club of Sacramento from 2000-2014 -- because his dad and entire family were A's fans. But when the Giants took him in the fourth round (118th overall) of the 2014 Draft, the Webbs traded their green for black and orange. Serendipitously, the River Cats became a San Francisco affiliate the next season. Still, the righty is not letting this potential dream scenario distract him from the task at hand. "I know it's a possibility, but it's not really on my mind," he said. "I'm just trying to go in every day and feel my best without any restrictions. My goal is to just stay open-minded and go in there and turn some heads." He's already turned quite a few, posting a 2.41 ERA with 100 strikeouts over 104 2/3 innings across 27 games -- 26 starts -- between Class A Advanced San Jose and Richmond last year. San Francisco added him to the 40-man roster on Nov. 20. That makes it plausible that a situation could arise where Webb forgoes one dream for another. Should an unexpected need surface at the Major League level -- such as injuries in the rotation -- the Rocklin High product would be considered a front-runner to fill the void. "If a need arises, he is absolutely a guy who can go from Double-A to the big leagues," Haines said. "With the stuff that he has now, there is no doubt in my mind that he can make the jump if needed." Harris feels the same way. "Not only does he have the stuff, he has the heart to make the jump and help a Major League team right now," the Richmond skipper said. "He's got that mindset, and I have a ton of confidence in him and his abilities." Of course, Webb would be A-OK with missing out on Raley Field if he was sent straight to Oracle Park. "Getting to the bigs is always the main goal," he said. "It would be awesome to go to Triple-A, but the main goal for every single person who plays this game is to get to the Majors and stay there. Obviously, I don't have a say in any of this, but however it turns out I'll be extremely grateful." Although he's poised to be a fast climber now, the beginning of his pro career included a considerable speed bump. Webb was shut down because of elbow issues after nine starts for Class A Augusta in 2016 and required Tommy John surgery. He wowed in his return with Class A Short Season Salem-Keizer in 2017. In 15 relief appearances with the Volcanoes that summer, Webb fanned 31 and walked seven over 28 frames. The organization also noticed some extra mustard on his fastball, which jumped from low-mid 90s to mid-high 90s. "We always had high aspirations for him," Haines said. "So we were very happy when he came back from that injury and he was stronger than before. We thought the surgery and the rehab would help him in the long run, and the first thing we noticed was an uptick in his velocity. So we let him work on his stuff out of the 'pen at first, but we always viewed him as a starting pitcher." The successful comeback doesn't mean the operation and recovery were a day at the beach for Webb, though. "The thing about [TJ surgery] is that it takes you away from baseball for about a year. You just get secluded from everyone and that kind of takes a toll on your mind," he said. "So I remember it being a really long process, and then getting back on a mound for the first time was very nerve-wracking. I think most people who had it done will say the same thing -- it kind of scares you. But after I threw that first pitch it just all came back. "I was struggling with some arm issues for the two years before that, but my arm felt great after that season and then just continued to feel great all of last season. So I definitely think, overall, it was a blessing in disguise. Just going through the whole process of the rehab, I think, helped me grow into my body and get stronger. And then that time at [Salem-Keizer] really helped me get my confidence back, relax and focus on everything I was supposed to do mechanics-wise." 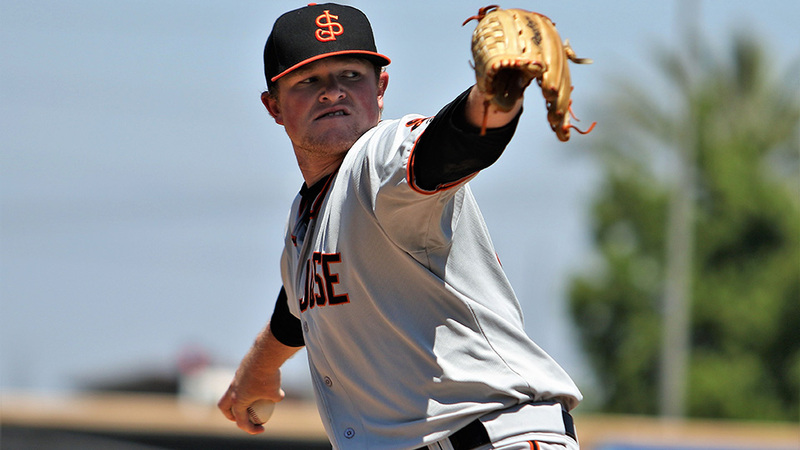 Webb overmatched the California League with San Jose at the start of 2018. In 21 appearances (20 starts) he limited opponents to a .207 average and posted a 1.82 ERA. "Logan is just one of those guys who works really hard. He's got a great mindset," said Matt Yourkin, who was the Volcanoes' pitching coach in 2017 and held the same role with San Jose last year. "I think early on he wasn't healthy and he was trying to grind, but after his surgery he was healthy again. We did our best to monitor his workload after that, and he really progressed. "Then in San Jose, we worked on how to use different pitches. How to sequence. And once he figured all that out, what his stuff is going to do, he had a lot of success and that helped build a lot of confidence, which is obviously huge." He punched out 74 over 74 Cal League innings. "That's a real tough hitter's league and when you put his age into consideration, it's even more impressive," Haines said. "He just did a fantastic job and we were excited with how he went in and progressed." Promoted on July 31, he posted a 3.82 ERA with 26 strikeouts and 11 walks over 30 2/3 innings across six starts with the Flying Squirrels. "He's a bulldog," Richmond pitching coach Glenn Dishman said. "Coming off TJ, we were sticking to an innings limit. But I knew he had a good arm and he showed a really good fastball and great curveball to go off of that -- and he's working on a changeup. But he does a lot of things well, especially for a kid his age. So we just focused on refining his game, getting him in the strike zone more consistently and, really, just staying healthy." While maintaining that focus on refinement in big league camp, he's picking the brain of a four-time All-Star. "It's been really cool to be here and have the chance to watch these guys who have been there and won a World Series," Webb said. "I've been talking to [Madison] Bumgarner a lot. He's been helping me out with getting down a good pregame routine. And it's not just him -- I'm trying to pick up whatever else I can from all of the guys." He made his Cactus League debut on Sunday, coming out of the bullpen against the Cubs and allowing a hit and a pair of walks while whiffing two over 1 2/3 scoreless frames. "The way he's going about his business here, you would think he was a couple-year veteran," Dishman said. "It's impressive how he handles himself, and his first outing was nice to watch him work. "He's already opened eyes, so now it's just a matter of continuing to prove himself. He's got to put up good numbers and stay healthy. If he does that, it's just a matter of time for him." A matter of time -- or circumstance -- for the youngster to make the leap and live out one dream or another. "In a perfect world, he'll get through Richmond and then Sacramento and defeat each level," Haines said. "But if needed, I believe the Eastern League can prepare someone for the big leagues easily."